What is the Child Identification Card? The Child Identification Card is a photo ID card issued to children 12+ attending full time second level education. This card will ensure that children between the ages of 12 – 15 can avail of all child fares where applicable on Bus Éireann services. What is the Student Identification Card? The Student Identification Card is a photo ID card issued to students 16 years of age and over attending full time second level education. 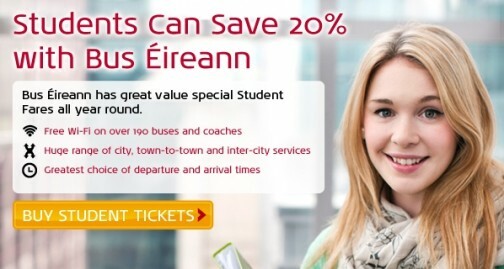 This card will entitle students to avail of all student fares where applicable on Bus Éireann services. Is the Student Identification Card valid for use by Third level Students? Cliceáil anseo chun an fhoirm Cárta Aitheantais a íoslódáil. Is there a charge for the Identification Card? No, the Identification Card is free of charge. Is the Identification Card accepted by any other transport company? No. The Bus Éireann Identification card is valid for Bus Éireann services ONLY within the Republic of Ireland. It is not valid on Translink or Ulsterbus Services. Completed application form (stamped and signed by your school). Two passport sized photographs (stamped by your school). A copy of your birth certificate applies to the Child Identification Card (under 16 year olds only). Please ensure you send a copy of your birth certificate and not the original. This will be kept on file. Please note item 5 on the following link for information on Data Protection. Local Travel Centres will issue your card as soon as it is possible for them to do so if you have the correct documentation and stock permitting. Postal applications to the above address will be issued to you within five working days of receipt of application. Allow up to three extra days for postage. How long is my Identification Card valid for? The Identification Card is valid from 1 September of the year of application to 31 August of the following year. Both Student and Child Identification Cards are valid from 1 September to 31 August of the current school year (or part year thereof). In the case of the Child Identification Card where the applicant’s 16th birthday falls before 31 August, the card will be valid up to and including the last day of the applicant’s 15th year. Thereafter a Student Identification Card must be obtained. What is the procedure if my card is lost or stolen? You are required to pay a non refundable administration fee of €5 by cheque/postal order or cash for a replacement card payable to Bus Éireann. You can send this to the above address with your application and we recommend that you do so by registered post. Please note that replacement cards will NOT be issued in Bus Éireann Travel Centres. Can I travel without my Identification Card? No, Children/Students are required to carry their Identification Card on them at all times when travelling with Bus Éireann and purchasing tickets at Child and Student rates. If you cannot produce your Identification Card you will be charged the full Adult fare and cannot seek a refund of this fare. The Identification Card is non transferrable and must be used by the applicant ONLY. The Identification Card will not be issued in any of Bus Éireanns issuing offices unless the correct documentation outlined above is supplied. For any queries please contact your local Travel Centre.